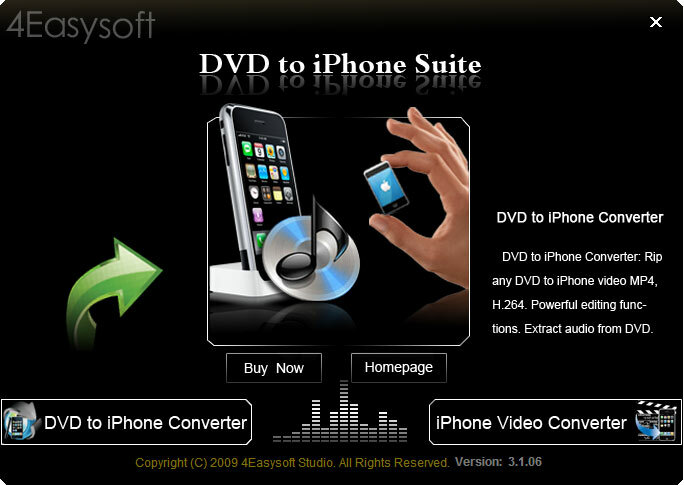 4Easysoft DVD to iPhone Suite possesses the double function of ripping DVD and converting video, which includes DVD to iPhone Converter and iPhone Video Converter. It can not only rip DVD to MPEG-4 (.mp4), H.264 (.mp4), MOV, MP3, AAC, AIFF, M4A, WAV for iPhone, iPhone OS 3.0, but also convert any files to iPhone video and extract audio, then convert to audio formats. With this DVD to iPhone Suite, it has some editing functions-Effect, Trim, Crop, Merge into one file. In addition, you can set the exact output video and audio parameters including video and audio bitrate, resolution, frame rate, etc. You can convert any DVD to MPEG-4 (.mp4), H.264 (.mp4), MOV, M4V video and MP3, AAC audio for iPod, iPhone, Apple TV and others by using DVD to iPhone Converter,. You can convert any formats to iPhone MPEG-4 (.mp4), H.264 (.mp4), MOV, M4V video with the iPhone Converter. It can also extract audio from video and convert audio formats to MP3, AAC, AIFF, M4A, WAV for iPhone. The ripped and converted files can be played on your iPhone, iPhone 3G, iPhone 3GS, iPod, iPod Touch, iPod Touch 2, iPod Nano, iPod Nano 4, iPod Classic, Apple TV, PSP, PS3.